So far there is no universal solution regarding treatment of gingival recession. 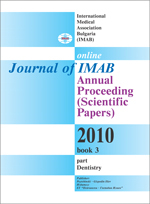 The author proposes his own version of updating one of the methods of treating gingival recession, namely a laterally moved flap with the addition of enamel matrix proteins. In the author’s opinion, this method is the least invasive and there are the least contraindications to it. Key words: gingival recession, laterally moved flap, Straumann Emdogain gel. 3. Santamaria MP, Ambrosano GM, Casati MZ, Nociti FH Jr, Sallum AW, Sallum EA. The influence of local anatomy on the outcome of treatment of gingival recession associated with non-carious cervical lesions. J Periodontol. 2010 Jul;81(7):1027-34. PubMed PMID: 20214443. 9. Grupe HE, Warren RF. Repair of gingival defects by a sliding flap operation.J.Periodontol 1956; 27:92-99.